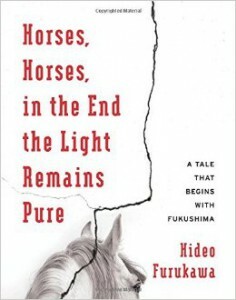 Horses, Horses, in the End the Light Remains Pure: A Tale that Begins with Fukushima by Hideo Furukawa, tr. Doug Slaymaker with Akiko Takenaka, Columbia University Press. Review: Justin Maki, Assistant Managing Editor. Hideo Furukawa’s newly-translated Horses, Horses, in the End the Light Remains Pure: A Tale that Begins with Fukushima offers some hope in this capacity. Written in the first months after the triple disaster struck, the Fukushima native’s literary response works to complicate and deepen what it means to “remember” an afflicted region. Rather than engage in only the personal side of remembering (his own childhood in the area and his relatives with contaminated farms are both kept to rather brief passages), Furukawa brings the reader into contact with the region in a variety of ways by using multiple genres—literary reportage, imagined scenes, alternate history—and perhaps most notably by invoking Gyuichiro Inuzuka, a character from one of his earlier novels, whose voice and “memories” of northeastern Japan appear at various moments throughout the book. Due to this connection, Horses, Horses has been called a sequel of sorts to The Holy Family, Furukawa’s 2008 epic novel in which the Inuzuka brothers go on a crime spree in Fukushima and its neighboring prefectures. The earlier book has yet to appear in English translation, but from details mentioned in Horses, Horses, the Inuzuka brothers seem to have been stolen in infancy by a group of warrior-monks whose secret lineage goes back some 700 years into the region’s history. In an inspired turn, Furukawa allows the older brother to appear in the present volume, showing up in the midst of the author’s visit to disaster-hit areas in early April 2011. The character draws on his “deep memory” of the region to narrate an imaginative history of its horses, from war horses at the fall of the Kamakura shogunate in 1333 to the traumatized tsunami-survivor horses the author meets at an abandoned shrine during his trip. By pairing observation and imagination in this way, Furukawa acts against two major pitfalls in the wake of an internationally-known crisis. First, he circumvents that awful shorthand whereby a place name comes to represent only a war or disaster that took place there; instead, he acquaints us with local geographies and strands of culture within the prefecture known for its long tradition of horse-breeding. In addition, while he doesn’t skimp on describing the damage wrought by the disaster and the scope of its human tragedy—in tandem with his own feelings when watching from afar and visiting up close—Furukawa also positions it in a much larger timeframe so as to avoid yoking the region to a single historical moment. The author, who prefers not to be labeled a Fukushima writer, makes the locality unforgettable by complicating rather than simplifying, giving the reader more to experience in prose and “remember” about the region than its direst hour—an effort far more promising than the crisis-driven news cycle in building lasting empathy. Translator Doug Slaymaker, with assistance from Akiko Takenaka, does an excellent job of keeping the various threads of the text in balance. Given the amount of extra information necessary for an English-language reader (religious terminology, place name meanings, historical references, etc. ), it is admirable that the translation moves along at such a good clip and preserves the agility of Furukawa’s voice(s). Horses, Horses is an essential text from one of Japan’s most prolific and inventive novelists, likely to remain important long beyond our current five-year remove from the events of 3/11. 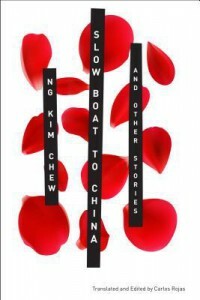 Slow Boat to China and Other Stories by Ng Kim Chew, tr. Carlos Rojas, Columbia University Press. Review Hannah Vose, Social Media Manager. Half a century later, Malaysian author and professor of Chinese literature Ng Kim Chew is obsessed with the possibilities. What if Yu survived? He was a polyglot, he had all the promise of an amazing writer—he could have been the Great Author that China was searching for. What if he escaped the Japanese and went on with life elsewhere? In Slow Boat to China and Other Stories, we see an array of vastly different realities. Now, not all the stories in Ng’s collection concern the possible fates of Yu Dafu, although they represent a sizeable portion. Slow Boat to China leads off with “The Disappearance of M,” which chronicles the public frenzy—and personal obsession for our protagonist—of trying to determine the identity of the author behind the critically acclaimed novel Kristmas, which is written in what amounts to a completely new language; its base is English, but it includes Arabic, German, Javanese, and Chinese oracle bone script among many other languages. In searching for the identity of the anonymous author, all the world has to go on is the letter “M,” a West Malaysian postmark and a charge to a Chinese deposit company. Native Malaysian writers and Malaysian writers of Chinese descent both claim the author for themselves, but no one is really sure. With the sophisticated linguistic background required to craft such a work, they must be a very special person indeed. Questions arise about the legitimacy of claiming the work for any one national heritage: can something written in English really be considered to be a great work of Chinese or Malaysian literature? A Chinese writer’s group decides that the real task is to find the original Chinese version of the work, which must exist, and work from there. “The unerasable past” wouldn’t be a half-bad alternate title for this collection. Everyone is haunted by their past, whether the past is the past where Yu Dafu disappeared, the past where they left their homes for a new country and new opportunity, or the past where they lost someone or part of themselves. Heritage and history, especially the melding of different cultures and ethnicities and all the creativity and conflict that this can cause—look no further than the debate over “M”’s identity for evidence—are at the forefront in every piece here. It is less the themes and more the character of the writing in this collection that really drew me in, however. Ng’s experimental writing traipses on the borders of reality, as though everything that happens is distorted by the swampy, thick air of the forest where much of his action takes place. Dream is indistinguishable from fact until the last second, woven into the narrative seamlessly only to set both reader and character up for an abrupt drop into reality. Dream and Swine and Aurora implements this in a way which is genuinely, stiflingly terrifying: a seemingly infinite Russian dolls of a dream of waking, each layer slightly more surreal than the last. Memory and conscious thought get tangled up all the time, and keeping track of reality sometimes feels like trying to breathe under water. It’s hard to read, but it’s rewarding. This is definitely not a one-sitting kind of collection. You will need some time to recover. As a whole, the collection is nicely curated and all the stories fit together in a sensible way. Carlos Rojas, Chinese translator extraordinaire, doesn’t disappoint in his masterful rendering of Ng’s tricky prose. The only piece I felt was slightly disjointed was the first story, the aforementioned “The Disappearance of M,” which seemed to me a little choppy and awkward. Given the linguistic complexity of Ng’s writing, however, this is the smallest of foibles. Rojas’s introduction is an invaluable part of this collection, both setting up the cultural context for Ng’s work, and explaining some of the linguistic trickery that needed to be accounted for in translation. As an English introduction to a great Malaysian author, I could hardly ask for better. 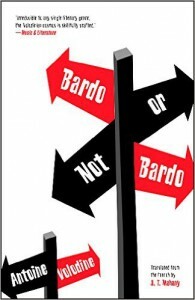 Bardo or not Bardo by Antoine Volodine, tr. J.T. Mahany, Open Letter. Review: Laura Garmeson, Executive Assistant. The opening of Antoine Volodine’s novel Bardo or not Bardo, translated from the French by J. T. Mahany, hurls the reader headlong into a murder scene amid agitated hens, errant gunshots, and vegetables. An assassination attempt near a Buddhist monastery is witnessed by a hapless nonagenarian monk, ‘touched more by Alzheimers than grace’, who hurries over to the victim. Elsewhere, the ceremony of the Five Precious Perfumed Oils is underway, leaving this monastic wing vacated but for our monk, who had been confined to the lavatory thanks to the ill-judged ingestion of fermented milk. His duty is to recite passages from the Tibetan Book of the Dead, known as the Bardo Thödol, to the dying man, providing him with much-needed guidance for his journey through the dreary posthumous smog, an infinite world of darkness that is the Bardo. There are precious few European books that really upset the tedious binaries of the Western Christian afterlife (the doomed torpor of Sartre’s 1944 play Huis clos is a renowned exception) but Volodine’s universe certainly does. According to the Bardo Thödol, after forty-nine days spent wandering the Bardo’s sprawling sweat and soot-infused tunnels and black charcoal plains, souls shall submit to either salvation or a rebirth. This provides Volodine with a predictably cheery platform for fiction: characters dully await something unknown which may or may not happen, experiencing a slow ebbing of memory in a barely visible landscape described as an ‘arid parade of blacks’. This is a hell so monotonous that the dead often fail to recognise they have entered it, but it gives rise to a gleefully disorienting work of black comedy. The seven sections comprising Bardo or not Bardo scuttle in and out of the ‘hermetic darkness’ of this spiritual limbo, which is also Volodine’s metaphysical arena of choice in which to play out the existential crisis vaunted in the title. The irony of such a title, of course, is that the deceased have no choice at all; they are irredeemably trapped in the Bardo, where chances of salvation seem doubtful. Volodine’s consistent use of the present tense throughout the book confirms this sense of suspension the Bardo confers, that of a ‘floating world’ in which past and future are not only non-existent, but crushingly irrelevant. The Volodinian narrator is, naturally, an ambiguous character in itself. This is due in part to the fact that Antoine Volodine is the primary pseudonym among many belonging to this French author, whose other works have appeared under the names Manuela Draeger, Lutz Bassmann and Elli Kronauer. Volodine has described the literary corpus of these heteronyms as works of ‘post-exoticism’, a self-coined phrase which constitutes a war cry to ‘official literature’. 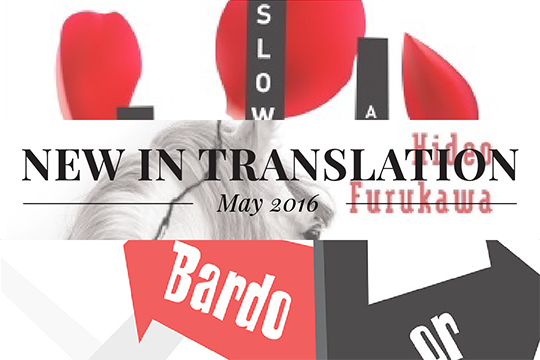 His extensive literary output is gradually being translated into English, and J. T. Mahany’s relaxed, playful rendering of Bardo or not Bardo is a welcome addition.